All pictures taken by Philip and Kumi Overby. Here's Kiyomizu Temple in Kyoto. One of the most famous and scenic places in all of Japan. Thousands visit here every year. Today I'm going to talk about traditional Japan. Hope you like it! Leaving the world of the weird and getting to blog on some traditional Japanese spots that I've enjoyed. This doesn't necessarily mean these are the best spots to go to, but I'll list where I've been and where other of my friends have recommended. If you want traditional Japan away from all the glitz and bright lights of the modern spectacles, then this list may be for you. Here's some pics from near Ryogoku, including me eating the famous sumo stew "chanko nabe." Very delicious! Enjoying some delicious chanko nabe! It has all sorts of stuff in it! So if you want a taste of modern and traditional Japan together, Tokyo has plenty of places to visit. I've been to Nikko but didn't visit any of the famous places there. However, I did go to a Edo Period recreation park which had lots of samurai walking around and even some traditional food being served. It was a pretty faithful recreation and a fun place to visit. Here's a pic with a samurai! And another at an oiran play, a traditional period play. While these aren't really representative of Nikko completely, you can find tons of traditional stuff there. Kamakura is actually pretty close to where I live. It used to even be the de-facto capital of Japan at one point. The most famous landmark is the Daibutsu or Amida Buddha statue that is rather iconic. I didn't see it when I was there, but I did see some temples and there are plenty of them here. When I went there it was dark, so I didn't get many good pics. But I did get a pic of some lanterns that were hanging everywhere. This was a nice place to go for a winter stroll. Kamakura is of course filled with historical sites, so if you're interested you can visit their website for more details. I've never been to Nara, but it is known for being one of the oldest and most traditional cities in Japan. It's been highly recommended by friends, so I'd like to visit there one day. One remarkable thing about Nara is that deer just wander about and that they are so familiar with humans that they'll just walk right up to you. There are several beautiful temples here as well that are probably best visited in the spring when you can see the sakura (cherry blossoms) in full bloom. The final spot belongs to Kyoto. Widely consider "the" spot to go if you want to experience all that can be found about traditional Japan. You can see maiko (apprentice geisha) walking about and even watch them perform with various instruments such as the koto or shamisen. You can try the local favorite: yatsuhashi. A sweet filled with beans or green tea and often very tasty! The biggest attraction here seems to be the temples though. The big three seem to be Kiyomizu-dera (Clearwater Temple), Ginkaku-ji (Silver Temple), and Kinkaku-ji (Golden Temple). I was able to visit two of the three and that wasn't even the tip of the iceberg. There are just so many places to visit in Kyoto it's impossible to get to them all, especially with the main source of transportation being the bus system. Here's one at Kinkaku-ji. Notice the golden color. I heard this temple was actually burned down and had to be rebuilt. So my monkey friend and I must bid you farewell now. With a tip of my hat, I'm off to find new adventures in Japan. What places have you visited that are historical or traditional, in Japan or worldwide? Ok, fine. We’re going to come to Japan. When my sweet, nervous husband asks why I’m dragging him clear across the planet, I’m blaming you and my grandmother. I always thought it would be a great place to visit, but now I feel this overwhelming need/desire to go. I don’t just mean in my lifetime. I mean before I’m 30 (in less than 4 years). If all goes according to plan, we’ll be seeing Japan in 2013. I looked up the places you listed and would love to visit them all. After reading so much about both sides of Japan (modern and historical), I want to see it all. I want to especially see the maiko of Kyoto. I read a certain place will let you try on a traditional geisha kimono. That would be incredible. In Tokyo, in addition to the Sumo Hall, I would want to see the modern buildings, homes, and markets. The beauty of the temples are captivating. I would love to hike in Neeko too. The traditional markets scattered throughout seem like they would be so much fun to walk through. Just to catch a glimpse of REAL LIFE Japan. Wow, I'm so giddy right now about the prospect of seeing Japan. I’m completely captivated by a place I’ve never seen. It’s an awesome feeling. Ok, I'm done now. PS: Thanks for writing for a request so quickly. Sayonara! 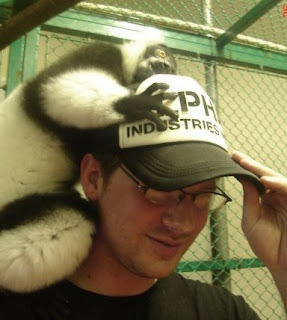 I'm not so sure that the cute primate on your head is a monkey. I think it's a lemur. Yep...definitely a lemur.